Short drive to Legoland, Lego House, and supermarkets in Billund. Kitchen was well equipped. One room had dark blinds to help the kids sleep in summer! How spacious and luxurious the property felt! The kids loved the trampoline! The apartment was spacious and clean, with an open plan living space. There was lots of Lego for the kids to play with. There was a large bathroom with an excellent walk in shower - good water pressure, lots of hot water. In addition there was a washing machine, washing powder and clothes horse. Outside the children enjoyed playing on the trampoline (albeit there was no safety net! ), on the swing and in the basket ball hoop area. The location was perfect for us just a short drive from the airport, Legoland and the Lego House, the property catered for all our needs especially our 5 year old Lego mad son who loved the boxes of Lego at the property and the swings/trampoline in the garden! Location , facilities in the apartment! Ease of checkin! A short drive from the Legoland. We loved everything about our stay! The host was friendly and helpful from beginning to end. The apartment (more like a large cottage) was really spacious, well appointed and so cozy! The grounds were beautiful and had a large patio table as well as toys for the kids. Plenty of room for 4 adults and 3 children. Beds were comfortable. Kitchen facilities were good. Very close to Legoland. 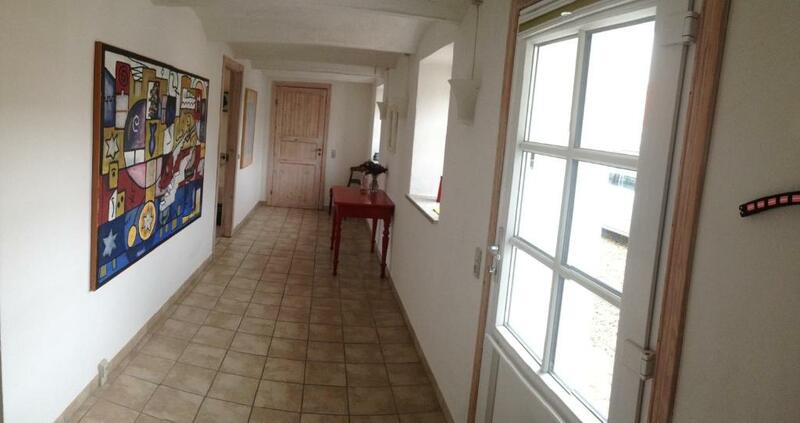 Lock in a great price for Brunbjerg Apartments – rated 9.1 by recent guests! Located in a quiet countryside location just 3.7 mi from Billund town center, these farmhouse-style apartments offer flat-screen TVs and free WiFi internet. Legoland Billund and Lalandia Water Park are a 10-minute drive away from Brunbjerg Apartments. A private terrace, electric cookers, a microwave and dining table are standard in each apartment. All have a washing machine and tea/coffee facilities. Bed linen and towels are included. Surrounded by woods and fields, the large garden offers plenty of space for outdoor activities. When would you like to stay at Brunbjerg Apartments? Offers a flat-screen TV, modern kitchen and a private, furnished terrace with BBQ grill. Offers a flat-screen TV, modern kitchen and a shared, furnished terrace. This apartment features a private entrance, stovetop and seating area. Brunbjerg ligger langt ude på landet - 6 km fra Billund by. Her går ingen bus og her er ingen fortov, cykelsti eller gadelygter. Her er skov, åben himmel og fred og ro. Derfor kan vi kun have gæster der kommer i bil. Her er en skøn udsigt til solnedgang. House Rules Brunbjerg Apartments takes special requests – add in the next step! Up to two children under 12 years are charged DKK 150 per night when using existing beds. Bed sheets are too expensive, they could ( and should) be included in the price..for a two nights stay, this represented 1/3 of the total amount of the stay. That said, i could have informed myself better. The stairs were very steep with small steps - you had to turn your feet sideways to come down safely, and this meant that I normally accompanied my 5 year old down the stairs. I guess for this reason, there is one single bedroom on the ground floor to accommodate anyone who really couldn't manage the stairs. As noted by owner, the rooms are well insulated which meant they got quite warm in summer. We did open doors and windows to cool things down but had to wait until biting insects had reduced. Hot water stopped at around 9am on the checkout day!. The couches were not comfortable and placed in a strange way. Wifi didn't work all the time. Not a problem for us, but FYI: the stairs were a bit steep. Fortunately there is a small bedroom downstairs if anyone in your group could not manage the stairs. And there was a sturdy gate at the top of the stairs, so no worries about little ones in the bedrooms upstairs. This was less than 10 minutes drive to Billund town and Legoland, but felt remote and extremely peaceful.It was nice to get a few days cooking the simpler, healthy food we like to eat after a few days of richer hotel and restaurant food. This self-catering accommodation had full electric cooker, electric kettle, toaster and microwave & fridge-freezer which was all we really wanted but had an extremely comprehensive array of pots, pans, glassware and other utensils so if desired, you could do very sophisticated cooking. What I loved was that there were basics like teabags, coffee, aluminum foil, washing-up liquid, pepper, salt and olive oil and a few other basics left, and beside the dishwasher there was a container of detergent tablets. Beside the washing machine, there was laundry detergent. It was lovely to do a full laundry but wouldn't have bothered if had needed to buy a whole pack of detergent. The garden was lovely and had space for smaller children to play. The road outside was straight with a grassy edge so it was possible to safely go for a morning run. The property was very easy to find. The host provided all necessary information in advance. She warned us that busses are not cruising at the time of our stay, and urged us to get a car for rent. All communication was very clear and precise. The location is great for entire family, the beds are comfortable and the rooms are very clean. Kitchen is provided with full utensils, fridge and dishwasher. Also enough coal for grill. We didn't miss anything at all, and if we would miss something, I am sure that Karen (the host) would provide it.